Have you ever noticed that pirates all seem to have bad teeth? Have you ever wondered why? Probably not, but in honor of “International Speak Like a Pirate Day” we thought we would share why pirates have such a poor reputation for terrible chompers! And the answers might also give us some helpful ideas for taking care of our own oral health. Scurvy was a serious problem. Scurvy is more than just a pirate insult. It’s a disease caused by a lack of vitamin C and it can cause severely weakened and receding gums. Pirates were often the victims of scurvy because they spent months at a time on the open seas with no access to fresh fruits and vegetables. 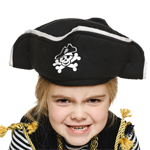 It wasn’t uncommon for pirates to have missing teeth due to poor gums. What does this mean for us? Eating a healthy diet with plenty of fresh fruits and vegetables can help us avoid looking like scurvy pirates! They didn’t brush their teeth. It wasn’t until 1938 that the modern toothbrush was invented. Until then, if pirates cleaned their teeth at all it would have been with a “chew stick” which was less than effective at keeping teeth clean and plaque at bay. Thankfully, today we have a lot of tooth-brushing options, the best being soft bristled and made to fit the size of your particular mouth. Brushing for at least two minutes, twice a day can help you keep your teeth ship-shape. It’s hard to make oral care a priority when you’re sailing the ocean and looking for innocent ships to plunder! Modern technology has made a tremendous difference in early cavity detection, but pirates would have had to rely on pain as an indicator that something was wrong with their teeth. By the time a cavity is severely hurting, however, it means that tooth decay has grown so severe that enamel and dentin have been worn away exposing sensitive nerves located in the pulp of your tooth. While we may not be able to enjoy the thrills of the open sea, we’re pretty thankful that regular dental visits can keep bacterial invaders at bay. There were no real dentists! In times past, dental services were practiced by people who had many trades. A pirate “dentist” may very well have also served as the ship’s cook, boatswain or master gunner. And while they may have tried their best at helping with dental care, being good with a cutlass doesn’t necessarily mean a pirate would make a good dentist! We love what we do, and we’re focused on proving the best dental care possible in a caring and relaxed environment. Pirates may not have had access to professional dental care, but you definitely have a pediatric dentist here at Kids Healthy Teeth. So you have no excuses to come see us! We hope to see you soon, matey! Previous post:Should Your Insurance Company Dictate Your Level of Dental Care?